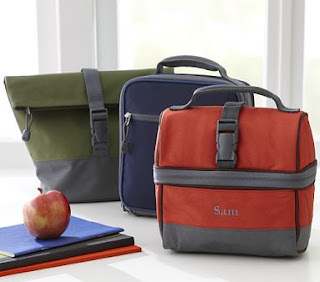 Pottery Barn drops the roll top lunch bag (the green one on left of picture) from $19.99 to $5.99!!! Plus, SHIPPING IS FREE!!! Available in three colors and is made of durable water resistent polyester and has room for food containers and a strap for hot or cold food containers or a bottle. Sales tax is charged to states with a Pottery Barn retail location. Go HERE now and grab it up, they wont last long...I got two before Christmas and used them as gifts for my future son in law and future daughter in law!